Have you got what it takes to win on TXS Hold‘em Poker Pro? The most appealing aspect of this poker game, is the ability to choose between low, standard or high-roller modes, with each mode containing vastly different table wagering limits, making TXS Hold’em Pro suitable for all. 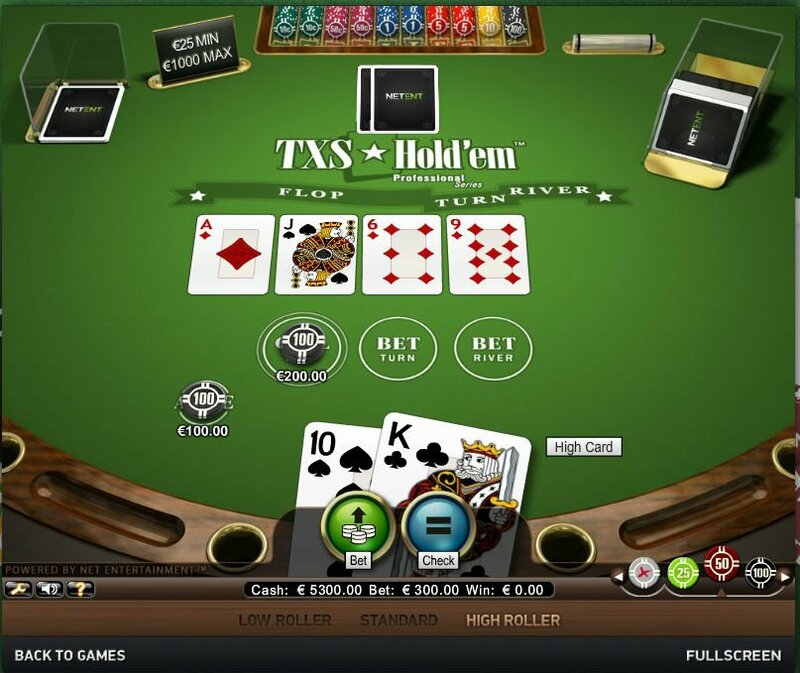 TXS Hold’em Pro is NetEnt’s take on Texas Hold’em poker, one of the most popular poker games today. This online poker game contains all your classic bets, as well as customisable low, standard or high-roller modes. 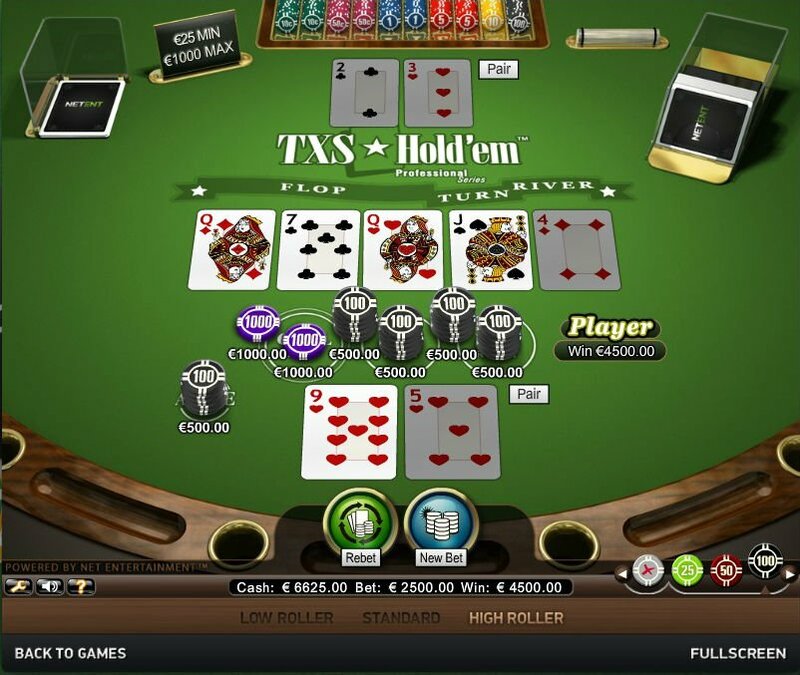 Chips sizes of 1.00, 5.00, and 10.00 can be selected in TXS Hold’em Pro, with table minimum and maximum bets fixed at 1.00, and 40.00 per hand, respectively. Gameplay begins after a bet has been made in the Ante betting circle. Two cards will be dealt to the player, and the dealer. If you don’t fold, you must place a bet worth double the Ante into the Flop betting circle. Three community cards will then be displayed. Players can then go through two more rounds of checking or betting (betting will cost a sum equal to your original Ante). Players will use the community cards in unison with their hole cards, to form a poker hand. Either the player or dealer will win, based on the strength of their hand. The standard win rate in the TXS Hold‘em Pro online poker game is 1:1, for all wins. In the event of a tie, the bet will push. This is quite a common pay-out for any poker game. 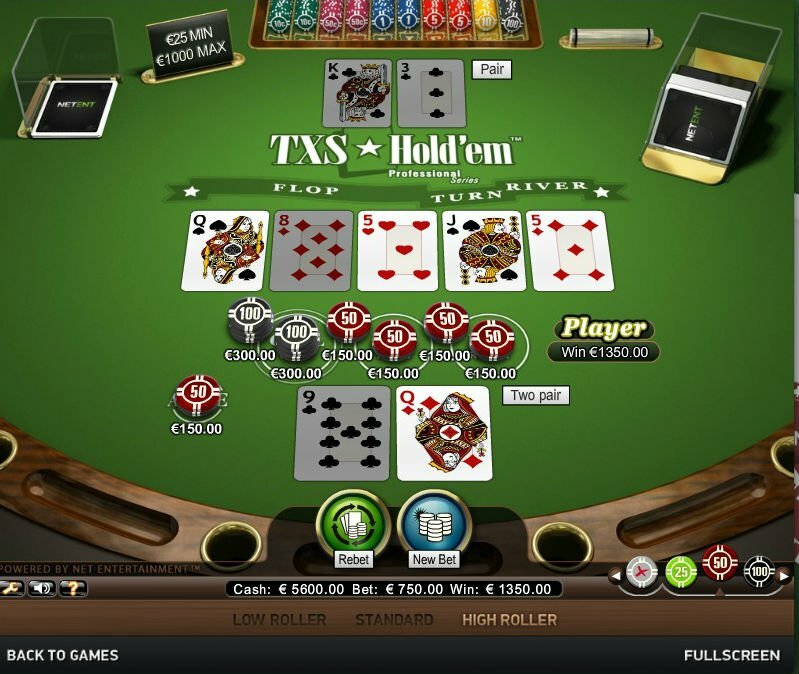 Playing poker online couldn’t be easier with TXS Hold’em Pro. Unlike common video poker games, this one sees you square off against the dealer, and features several rounds of betting. The most appealing aspect of this poker game, is the ability to choose between low, standard or high-roller modes, with each mode containing vastly different table wagering limits, making TXS Hold’em Pro suitable for all.